This bright, compact, and cute DLP projector uses its Full HD resolution well in a great value performance that even includes a backlit remote for blackout viewing. 3D and wireless HD cost extra. 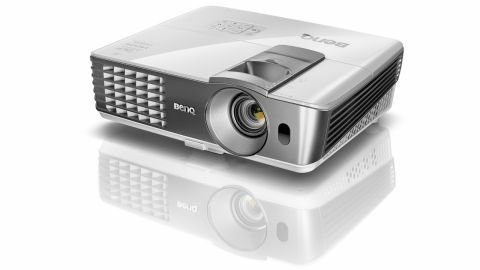 A great value projector for gaming and movies? Absolutely – and with some nifty extras, too. Measuring 312x104x244mm and weighing 2.75kg, it's surprisingly compact, while the sleek white styling is easy to live with. It also performs reasonably well in daylight, thanks to this single-chip DLP projectors' 2,200 ANSI Lumens lamp. That is of huge importance, especially in the long nights of summer, but also if you plan to use the W1070+ around the office. An age-old problem of projectors – and the reason they have never really caught-on in the average living room – is that the DVD player, set-top box and games console must be moved to wherever the projector is. Not so with the W1070+ if you take-up BenQ's offer of an optional wireless transmitter and receiver (which deal in uncompressed 1080p 2D or 3D, and itself has three HDMI inputs), though at £249 I suspect the WDS01 Wireless Full HD Kit won't be popular. In terms of ins and outs the W1070+ is reasonably well endowed on its own, with two HDMI inputs alongside composite video, component video, S-video, D-sub 15-pin for a PC, a RS232 control interface and two 3.5mm audio outputs. Happily, the remote control can be backlit – in red, no less, which will help your eyes remain dark-adapted if you're watching in a blackout. In my test the BenQ W1070+ proved easy to set-up using its zoom lens and focus ring, though I would like to have had proper dedicated lens shift levers (there is one provided, though oddly requires a screwdriver). A drop-down foot at the front projector, which is loosened and locked the pushbutton control, makes it easy to aim the recessed lens at a projection screen, while a wind-down foot on the back corner helps, too (though having a fixed right hand back foot did not). No matter, because the BenQ W1070+'s side-panel includes physical keystone correction buttons; I had a straight image within a couple of minutes. The wireless kit worked well, too, with a strong connection possible even if sturdy furniture is in the way. Initially activated in mid-afternoon in Bright mode, the W1070+ managed an excellent rendition of The Hobbit: The Desolation Of Smaug on an 80-inch screen amid a lot of ambient light. Black areas of the image were necessarily rather greyed-out and lifeless, but after the direct sunlight in my viewing room had receded the W1070+ was able to project colourful, detailed and very clean images, even polishing-up an ageing DVD of Gladiator without too much softness or noise. However, steer clear of the DLP Brilliant Colour mode if you want to retain that polished appearance because the increased saturation can mean a dollop of picture noise. With darkness prevailing, Cinema mode is by far the most accurate preset, while the lack of blur proved the W1070+'s fast response skills. It's that performance with the lights on though which massively extends the usefulness of the W1070+, as does the inclusion of the surprisingly loud built-in 10W speakers, which are always useful for a spot of instant gaming (not all games require surround sound, after all). Switch to 3D and the W1070+ performs well, too, with no sign of crosstalk amid plenty of clean and convincing depth effects. However, it's another no-show that impresses most; the W1070+'s lack of rainbow effect. I did spot the flicking colours emanating from the spinning wheel easily by moving my eyes quickly across the screen, but not once did I notice it while watching The Hobbit. Since I'm very sensitive to rainbow on DLP projectors, I therefore judge the W1070+ an excellent performer.